OnePlus 3T confirmed: Snapdragon 821 and 8GB of RAM? OnePlus has officially confirmed that it is indeed about to launch its next flagship smartphone and the date is set on November 15. 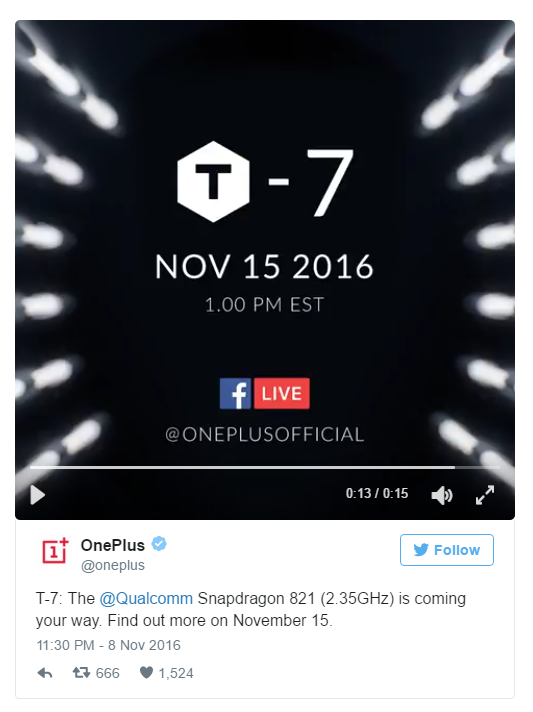 The company tweeted the following message on November 8 and confirmed what the rumor mill is still calling the OnePlus 3T. "T-7: The @Qualcomm Snapdragon 821 (2.35GHz) is coming your way. Find out more on November 15." Apart from the bump in processor as stated by the Tweet, Carl Pei has confirmed that the upcoming OnePlus device will also be sporting the same Optic AMOLED display as the OnePlus 3. As AMOLED displays provide punchier colors and deeper blacks to produce an overall better display quality than LCD panels, we were glad to hear that the rumor about OnePlus shifting to LCD in light of production issues with the AMOLED panels isn't true for now. Speculations regarding other specs include a 4,000 mAh battery, redesigned OxygenOS powered by Android 7.0 Nougat and most astoundingly, 8GB of RAM! We are not yet sure that OnePlus will actually opt for 8GB of RAM, but it can happen. We will find out everything in a few hours from now as the world prepares for the launch of the next "flagship killer" tomorrow. Tags: oneplus confirmed: snapdragon 821 8gb ram? Many fans were disappointed when the Galaxy Note 7 did not match up to the rumors of the smartphone sporting 6GB of RAM and a Qualcomm Snapdragon 821 processor. One could say that disappointment turned to bewilderment when some of the devices started to explode and a worldwide recall had to be arranged by Samsung. 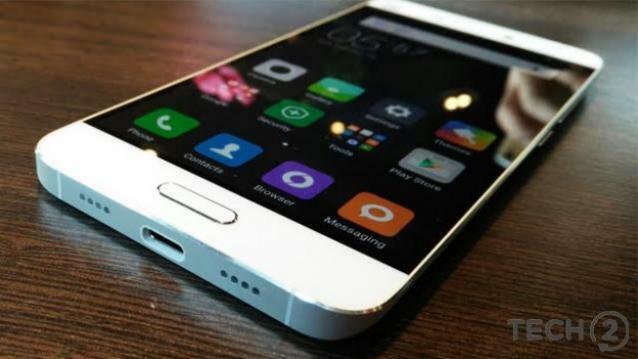 While Samsung sorts the entire mess out, new rumors indicate that Xiaomi is all set to launch the Mi 5s with 6GB of RAM and the mythical Snapdragon 821 chipset with a clock speed of 2.4 GHz. None of the other rumoured specs seem less than impressive either as it's supposed to be sporting 256GB of internal storage along with a pressure sensitive display. They will probably not upgrade the screen resolution to 1440p though and will instead possibly stick to the same 5.15-inch 1080p panel. Other specs include a 16-megapixel rear camera, a 4-megapixel front camera, fingerprint scanner, NFC, 2G, 3G, 4G, VoLTE and a 3,490mAh battery. Nothing is official though, so we would suggest waiting for a while before getting your hopes up too much. 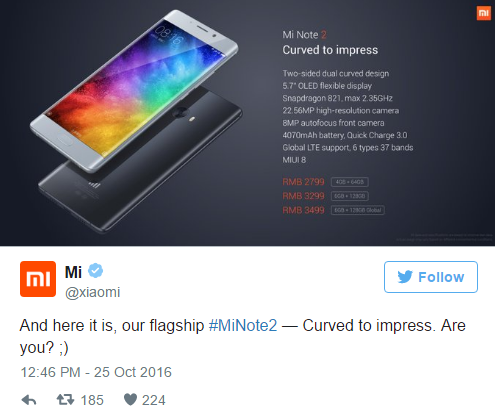 Smartphones are blurring the line between them and desktop computers nowadays and Xiaomi is about to blur that line even further with their upcoming Mi Note 2 Pro. According to a screenshot posted by AndroidPure, the upcoming handset from the Chinese manufacturer will sport beyond flagship grade specs like 8GB of RAM and a Qualcomm Snapdragon 821 CPU, clocked at 2.6GHz! The superphone will also have an in-built storage of 256GB and Google's latest and greatest Android OS Nougat will be running on it right out of the box. However, the only catch is that this "screenshot" could very well be a fake, much to our dismay. 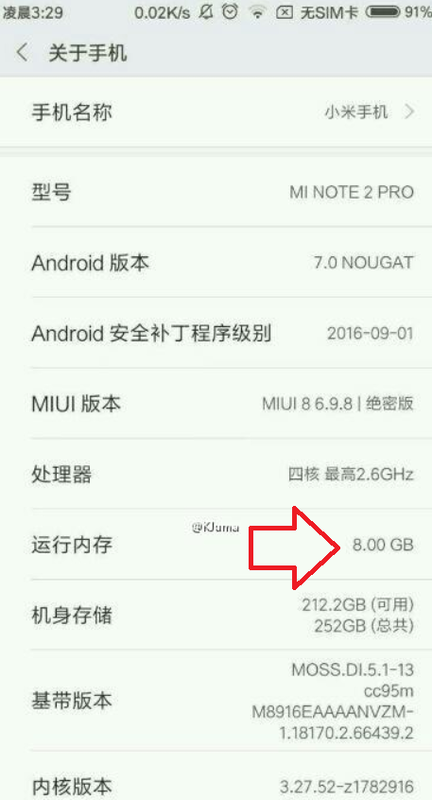 As we now know that the previously rumoured launch date of the Mi Note 2 Pro (September 24) turned out to be wrong, it still is a bit of a mystery as to when it will actually be released. Since the Mi5s and Mi5s Plus was just launched in China, the date for the Mi Note 2 Pro's launch could be further away than rumors had originally predicted. In case you are not aware, these two are also packing the Qualcomm SD 821 chipset and enhanced camera capabilities that the OEM has declared to be better than even those sported by the flagship grade Samsung and Apple smartphones. Considering that the smartphones also cost about half of what an Apple iPhone 7 or Samsung Galaxy Note 7 would cost, things are getting really tight for the big boys. Xiaomi is known mainly as the budget king of the smartphone world, but in an effort to outshine even the likes of the S7 Edge, today it has launched its most expensive smartphone in China. However, considering the beastly specifications that it boasts of, we would say it still is a budget device, if you consider the price-to-performance ratio. Just take a look at the specs unveiled today to get an idea about the proposition. Display: 5.7-inch dual curved QHD display (Flexible OLED). Even the staunchest of Samsung or Apple fans must admit that these are some impressive specs, at least on paper anyway. Once you consider the price, we are sure that you will find it even more interesting. The 4GB/64GB version is priced at CNY 2,799 ($410) and the 6GB/128GB version is available for CNY 3,499 ($515). The good news is that the 6GB/128GB variant will see international release, with global support for 37 LTE bands. 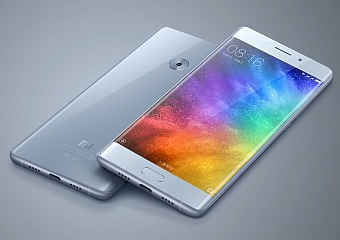 We cannot wait to see how the Xiaomi Note 2 performs once it's released.